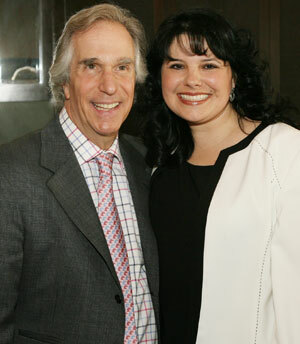 Special education program coordinator Cynthia Simpson was congratulated by actor Henry Winkler as the Gorin Award recipient during the a convention on April 2. Winkler was the keynote speaker at the event. Cynthia Simpson, assistant professor and program coordinator of special education, was recently awarded the 2008 Susan Phillips Gorin Award, the highest honor that can be bestowed on a professional member of the Council for Exceptional Children by its student membership. Simpson was recognized with the honor during the CEC National Convention in Boston on April 2 in front of approximately 2,800 attendees for exemplifying “the mission and values of the organization in various venues,” according to Sam Houston Council for Exceptional Children student chapter president James Williams. The Susan Phillips Gorin Award honors a CEC member who has demonstrated exemplary personal and professional qualities while making outstanding contributions to CEC and to exceptional children. Simpson was nominated for the award by SCEC members, as well as faculty members within SHSU’s department of language, literacy and special populations. “As a faculty, we truly dedicate ourselves to preparing future leaders who will not only become change agents within the schools they will teach in, but also within the communities they live,” Simpson said. “Those students who have transitioned through our programs have become advocates for the children they serve and have helped to ensure that children with exceptionalities are meaningful participants in our society. “It is their successes that have ultimately lead me to be the recipient of the Susan Phillips Gorin Award,” she said. As part of the honor, Simpson was awarded a plaque and will have her name permanently displayed on the Susan Phillips Gorin Award plaque at CEC headquarters in Washington, D.C.
CEC is an international organization with over 35,000 members who are dedicated to improving the quality of life for individuals with exceptionalities and their families worldwide through professional excellence and advocacy. Henry Winkler, best known for his role as "Fonzie" in Happy Days and author of many children's books, was the keynote speaker during the conference.